The 18-hole Eagle Falls Golf Course in Indio, CA is a resort golf course that opened in 2005. Designed by Clive Clark, Eagle Falls Golf Course measures 6715 yards from the longest tees and has a slope rating of 133 and a 72. The mountains are close enough to touch at this Arthur Hills design. Heritage Palms measures 6,698 yards from the back tees. Four lakes are featured on the course, which is very green for a desert design. Hills contrast the fairways against the mountains and the desert in the distance, but this is very much a resort type course. If you're sick of getting beat up and spit out by all the big-name, big-bite courses in the Palm Springs resort area paradise of La Quinta, Indian Springs could be the course for you. This track provides a reprieve from the hacker battering. The design is pretty straight forward. Water only comes into play on two holes. The fairways are mostly flat. The 18-hole Indio Golf Course in Indio, CA is a municipal golf course that opened in 1965. Designed by Lawrence Hughes, Indio Golf Course measures 3004 yards from the longest tees and has a slope rating of 77 and a 54. The Golf Club at Terra Lago boasts two 18-hole courses, the North and the South, that provide some of the most stunning and unique views of the Coachella Valley. Terra Lago's North Course is the longer of the two at 7,060 yards, which is partly a reflection of the dramatic elevation changes that the golf course tumbles across. 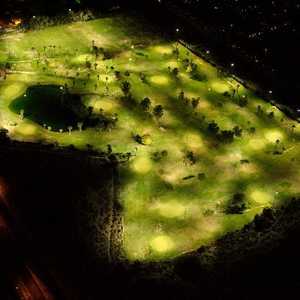 The 9-hole Outdoor Resort Indio in Indio, CA is a private golf course that opened in 1991. The 18-hole Plantation Golf Club in Indio, CA is a private golf course that opened in 1996. Designed by Brian Curley and Fred Couples, Plantation Golf Club measures 7142 yards from the longest tees and has a slope rating of 131 and a 74. The 18-hole Rancho Casa Blanca Country Club in Indio, CA is a private golf course that opened in 1991. Rancho Casa Blanca Country Club measures 1302 yards from the longest tees. The 18-hole Shadow Hills Golf Club in Indio, CA is a public golf course that opened in 2004. Designed by Lee E. Schmidt, Shadow Hills Golf Club measures 6773 yards from the longest tees and has a slope rating of 134 and a 72. There are two 18-hole courses available called the North and the South. At 7,044 yards, Terra Lago's South Course is just barely shorter than the 7,060-yard North Course but they are equally challenging. The South is known for having one of the club's most unique and memorable holes, the par-4 second.